The master's latest essay film is a hard nut to crack, but it's worth the effort. With The Image Book, Jean-Luc Godard is still at it at age 87. His presence was strongly felt at Cannes in 2018, with its poster of Belmondo and Karina kissing from Pierrot le fou (purely out of their nostalgia trip and other superficial reasons), as well as the Cate Blanchet-led jury ironically awarding him 'the Special Palm d'or,' whatever that means. But in stark contrast to the youthful exuberance and liberty of his earlier films, The Image Book is, in large part and as expected, dark, brooding and more inscrutable than ever. It's also an indirect condemnation of the cheap spectacle that the festival has become. Completely consisting of existing footage -- from Hollywood, European and Soviet films, war atrocities, news footage of ISIS and films from the Middle East in its later portions -- Godard grimly goes on about the power, or lack thereof, of images in his raspy, groveling voice over. Like most of his essay films since the monumental Histoire(s) du cinema, his fragmented, loosely connected images have been, if anything, reminders of the terrible history of humankind. The Image Book is no exception. With Bertolt Brecht's quote, "Only a fragment carries a mark of authenticity," he somewhat frees us from dwelling on his use of edits: how he cuts two images together, how he stops and drags an image, his discontinuous soundtrack, spastic English subtitles and digital manipulation where colors bleed and image become almost abstract. Truth is in the images themselves. And as far as collages go, it's an assault on your eyeballs, very much like that famous shot from Un Chien Andalou, which he references in the film. His thin image thread is there with the picture of a hand pointing up, renaissance paintings where gestures have hidden meanings, and recognizable movie clips, which include Vertigo, Kiss Me Deadly, Ivan the Terrible, Dr. Mabuse, Johnny Guitar, many from his own filmography, and countless others I don't recognize. Train shots from various films invariably ends up in Auschwitz footage, with Godard saying, "I have the courage to imagine. I take the train of history and I think of people who take the train for a job and who do not have courage to imagine." With images of 35mm film going through a projector, its thick and hammy celluloid strip jittering through the loop like a convulsing snake or slap of meat going through a tenderizer, Godard puts emphasis on the physicality of communication, the visual language, rather than a spoken one. The second half of the film settles into the West's notion of the Middle East as it was chastised by Edward Said in Orientalism. 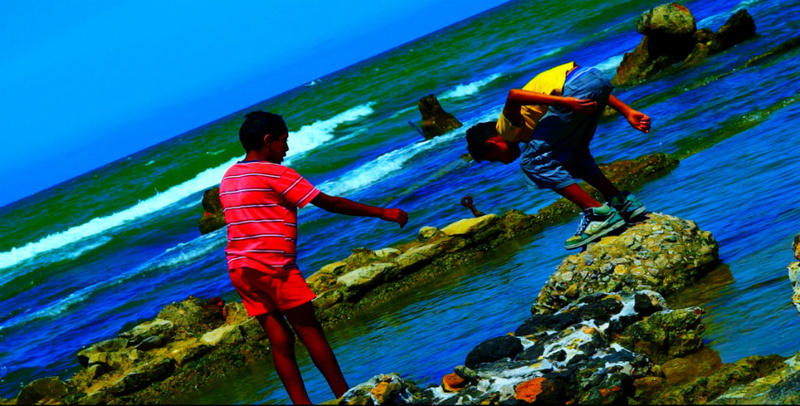 With a barrage of film clips from old Egyptian films and other Middle Eastern nations, Godard examines An Ambition in the Desert, a book by Albert Cossery, an Egyptian born French writer. The book tells a story of an imagined Middle Eastern emirate called Dofa, a non-oil producing state that therefore escaped from the Western colonialists' influence. It's deemed as a paradise in the Middle East. A series of explosions rocks Dofa. Samantar, the main character of the story, finds out the attacks are planned by the Machiavellian Prime Minister of the emirate, Sheik Ben Kadem, who welcomes the influence from the West for his own political gain. Godard delves deeply into the subject, juxtaposing old Egyptian movie clips, surveillance ISIS footage and everyday street footage digitally manipulated to abstraction. Godard's latest offerings are hard nuts to crack, even more so than usual. The Image Book is also one that needs to be mulled over after viewing. I didn't know about Cossery's book. I had to look it up. Even as an avid fan of his filmography, most of the stuff he talks about goes over my head. But with The Image Book, there seems to be a concerted effort for Godard to point us in the direction where he sees a corner of the world that is underexposed, underseen and misrepresented by the Western world. He references his 1987 film King Lear a lot in The Image Book, especially a shot of Cordelia (Molly Ringwald)'s dead body lying on the rocks, as if telling us that Cordelia, the righteous, virtuous one, is dead and there is no good one left in the world. He also leaves in his coughing fit during the middle of voice over. Godard knows his time is almost up. There is a sense of urgency in his gravelly voice. Say what you will about his cranky attitude, his stubbornness all these years not to conform, his perceived snobbiness. Yes, the representation and how you tell the story matters. But I'd rather get dictation from Godard and have him point me in the right direction than from anybody else. I sincerely hope The Image Book is not his farewell message to the world. Review originally published during the New York Film Festival in October 2018. The film will open in select U.S. theaters on Friday, January 25, 2019 via Kino Lorber.